Prototype to Kickstarter - The story of Mars Horizon: Blast Off! Now it’s quite common for when we’re testing a gameplay idea for us to revert to good old fashioned pen-and-paper. This project was no exception. There were many prototypes that we built at various points to test different ideas. One of these ideas though, shone out above the rest. The video game has always been intended to be an authentic look at what it would be like to run mission control. So we have been working with the UK Space Agency (UKSA) to make sure that what we were saying was correct. We decided to pop along to their very nice offices and take along the prototype. 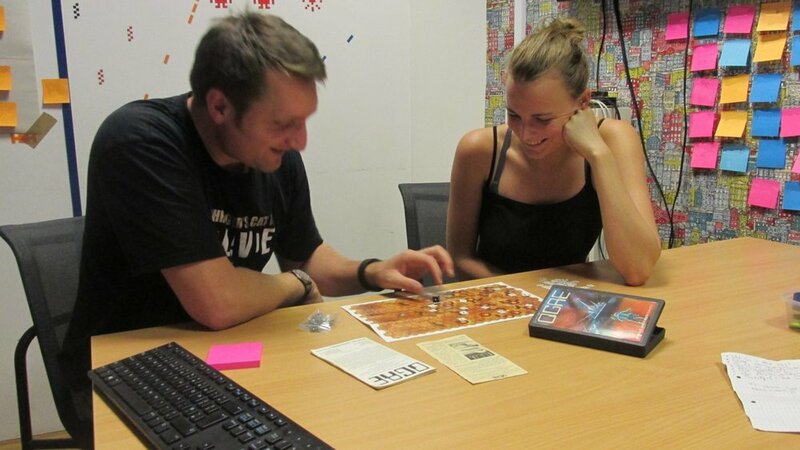 There we met their informal lunchtime boardgame club (I know… very cool!). To our delight we had the some great feedback, including how great this would be as a physical game too. That idea stuck with us, so we went away and did some more work. We also decided to demo the game at two boardgame events - just to sanity check our thinking. City of Games in Bristol and Dragonmeet in London. Both times we had the same sort of feedback. What is the game like? The game puts you in the hot seat of a space agency as it attempts to get a mission to Mars. You managing your resources and invest in buildings, technology and vehicles to get there before anyone else. What does it share with the digital version? The key thing it shares is the theme - getting the first crewed mission to Mars. It shares an art style and the missions listed are actual space missions - past and future. It also shares a bunch of gameplay ideas on the way rockets, vehicles and facilities work. But, over time the card game has created its own life that has emerged from the extensive testing and iteration. So each is its own thing. They are sister games both proudly carrying the Mars Horizon title and logo. So we are going to be Kickstarting the game. If this is your first time to the concept we’ve come up with a handy guide to explain everything as simply as we can. If you are already on Kickstarter you can follow our page now! You'll get all the latest information as soon as it comes out. When is Mars Horizon digital coming out? There is a ton of really awesome stuff going into the digital game at the moment (including some awesome reveals, like the one below) and the development team working on it is bigger than ever. We are getting loads done and it is looking more and more like it’s ready for some serious testing soon. So we hope to have a firmer date for you soon… keep an eye on the Steam page where we will update everyone with the latest news! Marketing and Community Manager for Auroch Digital in Bristol, UK. It’s been one heck of a busy month for us! Where to begin...? The release of Ogre went rather well. Most importantly, the team launched a solid game and then immediately began improving the experience based on user feedback. We always wanted to be completely transparent with the community of loyal fans Ogre has, so you can see the regularly updated patch notes here, which documents feature requests we’ve implemented, bugs squashed, and quality of life improvements made. Ogre is currently enjoying a 'Positive' review rating on Steam, which we’re thrilled with. Steam, Humble, Green Man Gaming, and Gamersgate all supported the game, featuring Ogre on their front pages and social media channels. The title got into the New and Trending and Popular New Releases sections of Steam too which, again, was a fantastic result. Press reception was largely positive from a good deal of outlets, with a smattering of mixed opinions too, which we pretty much expected. It was wonderful seeing screenshots and video of the game being featured on sites like Rock, Paper, Shotgun, PC Gamer, PCGamesInsider.biz, Bell of Lost Souls, and GamesRadar. We were also delighted to read that the original artist of Ogre - the mighty Winchell Chung - was a fan of how the game turned out. More generally at the studio, though no doubt thanks in part to our work on Ogre, we’ve been talking with B2B outlets about how we convert tabletop experiences into digital ones, and the process of making games in general. You can see these interviews on leading publication Gamasutra, non-profit industry champion Creative England, and brilliantly supportive local outlet Bristol 24/7. And as if we needed an excuse to talk more, we can confirm that we’ll be speaking at international games conference Games Forum 2018, which we’ll share more details about in the coming months. Though it’s probably slightly too early for most to be thinking about mince pies and crackers, we’ve been hard at work creating a series of Cthulhu Christmas Cards, which we’ve just launched the crowdfunding campaign for on Kickstarter. There’s loads of details about what they are, why we’re doing them, and so on on the Kickstarter page, but one neat thing some people have missed is that, since we’re games designers at heart, we’ve hidden a puzzle that runs through all six designs that come in the box. If you’re a fan of all things Eldritch, it’s definitely worth a look and, hey, maybe you should follow us on Twitter and Facebook too, because who knows what other horrors we may have in-store in the near future…?